7 years ago today, Ben and I made a final trip to the OB and were told to grab lunch and check in at the hospital that I was dilated enough to have this baby! At 11:21 pm, I was holding a tiny 6 lb. boy in my arms. Elijah Malcom Pilgreen was born in West Monroe, Louisiana and has alreaday called Ruston, LA, Tuscaloosa, AL, Springfield, MO, and San Francisco, CA home. Elijah's 7 years have been nothing short of an adventure that he has handled well...in fact, soared through! So, here's how we celebrated! And we LOVE to celebrate LIFE! Saturday, September 25th, we invited two friends to join us on a tour of the SF Giants Stadium. That evening, we celebrated with the McCord family in our home. Sunday, September 26th, our Epic Church Launch Team sang Happy Birthday as he blew out candles. Wednesday, September 29th, our family took Elijah to his favorite restaurant, Wing Stop! He put down at least 15 wings and received some very special gifts. Sam and Asher gave him a Star Wars book and Tim Lincecum (Giants pitcher) action figure. Dad gave him a ticket to personally see Audrey Huff and Pablo Sandaval on the afternoon of his birthday where he can get a bat and ball signed and have his picture taken with them! Mom, like always, wrote him a birthday book. This one entitled, In The Shadow, the imagina-reality tale of majors and giants. It's a story of a kid who grew up in the shadow of the Giants baseball stadium and how his dreams come true! 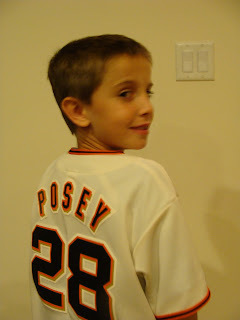 Before bedtime, Elijah called GJ (Ben's dad) and opened his gift from him - a SF Giants Buster Posey jersey...the real thing! And we're still celebrating! Elijah will celebrate with his friends at school with sugar cookies and apple slices. His Aunt Natalie is flying in from Louisville, KY, and he gets to skype with grandparents, friends and open their gifts! For us, birthdays are a way of really celebrating the life we've been given and allowing those around us to express their love and words of affirmation. And stick around 'cause I will post pics and story of our personal encounter with 2 great Giants players tomorrow! Talk about a dream come true!